Designed for the SMB sector, Tandberg’s LTO-3 HH is the ideal synthesis of efficiency, modern innovation and maximum price/performance ratio. LTO's 6 generation roadmap, with 4 generations available today, makes it a clear choice for budget constrained small to medium businesses. Choose a technology with a future and guaranteed trouble-free data storage. In data storage systems high quality standards, high performance and downtime free operation must be guaranteed. The unique cooling airflow completely eliminates the need for a separate fan. This reduces the number of components that can fail. Power requirements are reduced to a minimum. 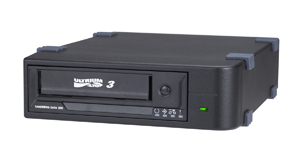 The drive incorporates enterprise level features such as intelligent head cleaning, sophisticated tape threading, and extensive media management. The Tandberg LTO-3 HH ships with Symantec’s Backup Exec QuickStart software, embedded media management for intelligent diagnostics and tape alerts, and comes with 3 years warranty and support.